I am so ready to make cards and projects using my new stamp sets from the Occasions Catalog! And in just a few days, Sale-A-Bration starts. What a great way to stock up on these great new stamps and get other great stamps and Designer Series Papers for free! Have you seen those chickens in the Sale-A-Bration brochure? Too cute. But today's post is all about ice cream. I love ice cream. There's nothing better than a bowl of ice cream after lunch, after dinner, before bedtime, for an afternoon snack, and just about any other time of day. What's your favorite flavor? Doesn't matter to me - I'll eat any kind as long as it is covered in chocolate. 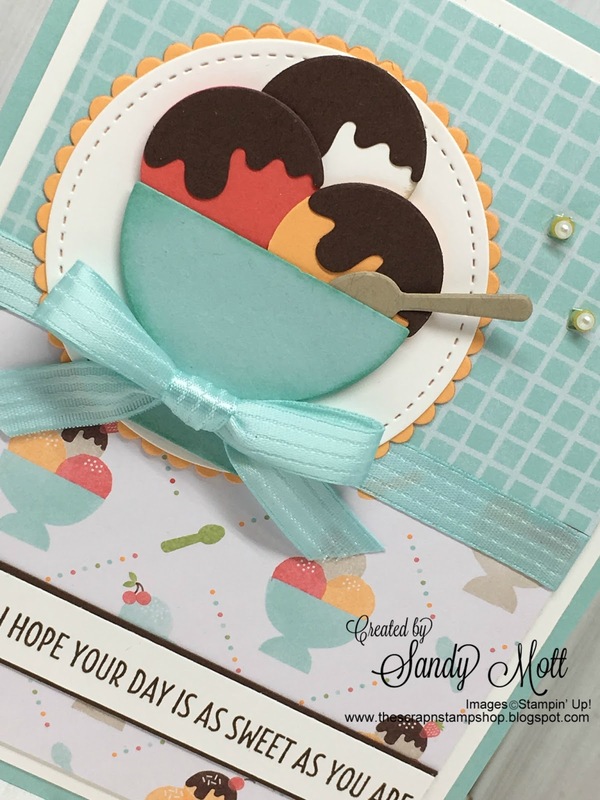 The "Cool Treats" stamp set and the "Frozen Treats" Framelits Dies are adorable. I will be using them often. The ice cream is cut from the dies in Peekaboo Peach, Whisper White, and Watermelon Wonder cardstocks. Using the Stitched Shapes Framelits, I matted the sundae bowl on a piece of Whisper White cardstock. Then I matted it again using the Layering Circles Framelits on a piece of Peekaboo Peach cardstock. 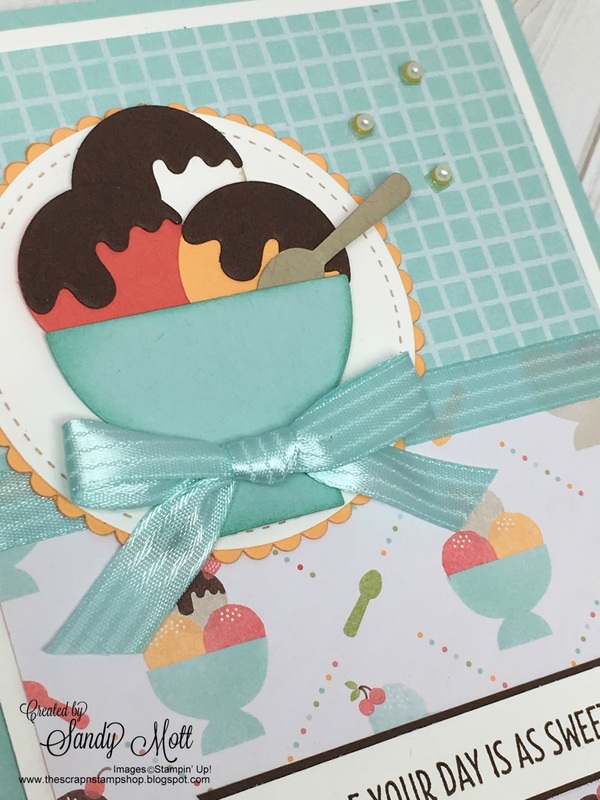 The chocolate is also cut from the dies using Chocolate Chip cardstock. This is an easy card to make and uses mostly framelits. The only stamping involved is the sentiment, which I backed with a piece of Chocolate Chip cardstock. 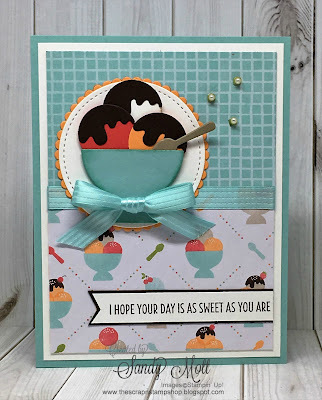 The Tasty Treats Specialty Designer Series Paper coordinates with and compliments the stamps/framelits. I added Pool Party ribbon and the adorable new embellishments called "Sprinkles". The sprinkles on my card are actually two different sequins (one Pool Party square, and a Peek-A-Boo peach cup on top of that). Then I layered a third embellishment, little tiny pearls. These embellishments would probably be better suited for a shaker card because they are tiny. I had a hard time even using tweezers, but they are so pretty on the card. It's one of those "can't see it good in the picture, but you should see it in person" kind of embellishment. The inside sentiment simply says "Happy Birthday". Stay tuned for more Occasions Catalog goodies, Blog Hops, and Design Team projects in the coming weeks.